A all Copper Boiler built to operate at 100 psig with 5.91" Drivers. A ride on tender for an easy ride and designed for years of trouble free service. Will easily haul a half dozen adults on level track. Coal firing is this Steamers standard yet may be fitted with a very efficient Propane Gas Burner for an additional fee. Please feel free to contact us for pricing and delivery time. Other designs are available. We also have the Planet in 1" scale 4 3/4" gauge or 2 1/2" scale 7 1/2" gauge. We have Battery and gasoline power in the larger version. Contact us for pricing and delivery time on the engine and tender. The tried and true Maxitrak Lil' Jo is a proven design that has been around for years. Multiple wheel arrangements are available. 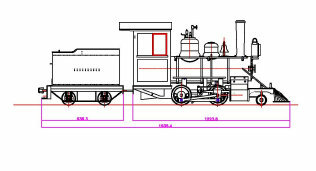 Our favorite is the 2-4-0 with tender. You decide as well as coal firing with the option of a Propane Gas Burner. 7 1/2" gauge is the standard on this Steamer.